In this digital era, customers are more powerful and demanding than ever before. The window of opportunity to delight customers and maximise every customer interaction is reduced to seconds. Understanding how to communicate to your customers using the most effective traditional and digital channels with the most relevant message has become critical to success. Forrester recently gauged opinion from 590 CEOs and senior business leaders working across Europe, the Middle East, and Africa to produce a report entitled “The New Frontier: Unlocking the value of data”. The research highlighted that whilst 87% of South African organizations recognize gaining better insights on their customers as one of their top business priorities, many of them are unable to effectively respond to customer demands with only 15% have a strategy to deliver a consistent customer experience across the life cycle. You’re invited to discuss emerging trends, challenges, insight and market impacts with fellow C-Level decision-makers. What does an insight driven business look like today? 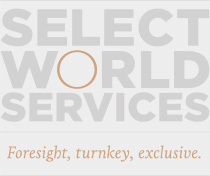 JOIN US for senior-level conversations, exchange of ideas and networking at Select World Services’ Exclusive, intimate, by invitation only CXO dinner Becoming a True Insight-Driven Business – Connecting the Unconnected to Maximize Customer Experience and Value Across the Life Cycle. And VPs, Head of Departments, and Directors with responsibilities in Marketing, Customer Experience/Engagement and Insight, Digital, and Business Intelligence.